Death Toll From Latest Oklahoma Tornado Rises Further : The Two-Way Oklahoma officials put the number of deaths from Friday night's storms at 18 as of Monday evening, with several victims still not identified. 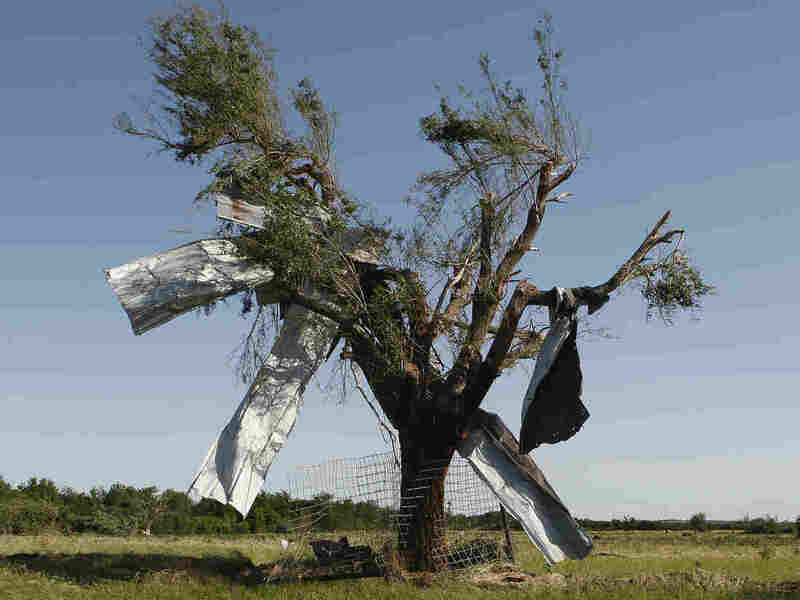 The strongest storm Friday tore through El Reno, Okla. Forecasters are warning there could be more severe weather in Oklahoma on Monday and Tuesday. After the storm: Sheet metal that was torn off a building during Friday's tornado in El Reno, Okla., ended up caught in a tree. There are now reports that as many as 18 people died from injuries they received Friday when the latest in a weeks-long series of tornado-spawning storms tore through parts of Oklahoma. "At least 16 people are dead across the state from a vicious storm that spawned at least five tornadoes there late Friday, officials said Monday. And the death toll may rise further." "At least 16 people — including five children and three veteran storm chasers — were dead and the search continued Sunday for more victims of tornadoes and floodwaters that swept through the Oklahoma City area Friday night." Reuters puts the number of confirmed deaths at 13. So does The Associated Press, which warns that seven people are still unaccounted for. As happens during disasters, there will be conflicting information as the story develops. We'll focus on what's being reported by officials and credible news outlets. And we'll update as new information comes in. On Sunday, when Eyder wrote about the deaths of the storm chasers, the death toll had stood at 10. Friday's storm hit 11 days after the May 20 tornado that devastated the Oklahoma City suburb of Moore — killing 24 people and wounding more than 275. Unfortunately for those in the Oklahoma City area, the National Weather Service is warning that they're likely to be hit by some more severe weather on Monday and Tuesday. There's a "slight risk" of severe thunderstorms through that region (as well as in parts of northwest Texas, southern and eastern Kansas, southeastern Colorado and western Missouri). The storms could also produce "perhaps a tornado or two," the weather service says.